G20 Finance Ministers and Central Bankers are gathering in Korea right now talking about currencies. There has been a lot of speculation about whether or not a statement will released on Saturday that show a unified view on currencies. In my article G20 Wildcard, I wrote extensively about the possible language that the G20 could agree on and other topics that are being debated at the meeting as we speak. However as currency traders, what we really care about is how it impacts currencies. The following monthly chart shows how the EUR/USD traded after the G7 changed the language in the currency portion of their communique (fancy word for official statement). This will be the first G20 statement on currencies because in the past, these big announcements would be made at the G7/G8 meetings. As you can see in the chart, the language changes have marked both short and long term tops in the EUR/USD. Since this is a monthly chart, even the small reversals have been more than 1000 pips or roughly to 7 to 10 percent. 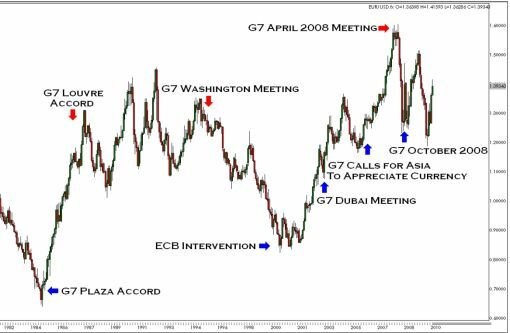 Any coordinated message on currencies will look more like the Plaza Accord, which was aimed at weakening the dollar than the Louvre Accord which supported it.